Croatia have sacked one of their coaching staff, Ognjen Vukojevic after he posted a pro-Ukraine video following the penalty shootout win over Russia in the World Cup quarter-finals. Vukojevic, a former Croatia international, published the video on social media after the match on Saturday in a move which was criticised by Russian politicians. This led to a warning from FIFA’s disciplinary committee. Vukojevic and Vida have both played for Ukrainian side Dynamo Kiev. Vida had on Sunday said that the “glory to Ukraine” video he posted after his team beat Russia on penalties in the World Cup quarter-finals on Saturday night was not a political message. 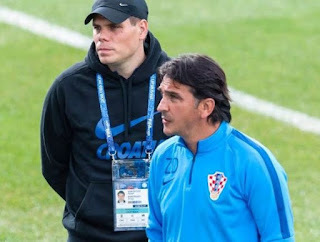 The Croatian Football Federation (HNS) in a statement on Tuesday said it had revoked Vukojevic’s accreditation at the World Cup and relieved him of his duties as an associate of the Croatia coaching staff. “HNS hereby apologises to the Russian public for the actions of a member of the Croatian delegation,” the statement reads. HNS also said that Vukojevic and Vida apologised for their statements, saying they were not intended to be political messages but “unfortunately left room for such interpretations”. Croatia face England in the World Cup semi-finals in Moscow on Wednesday night.